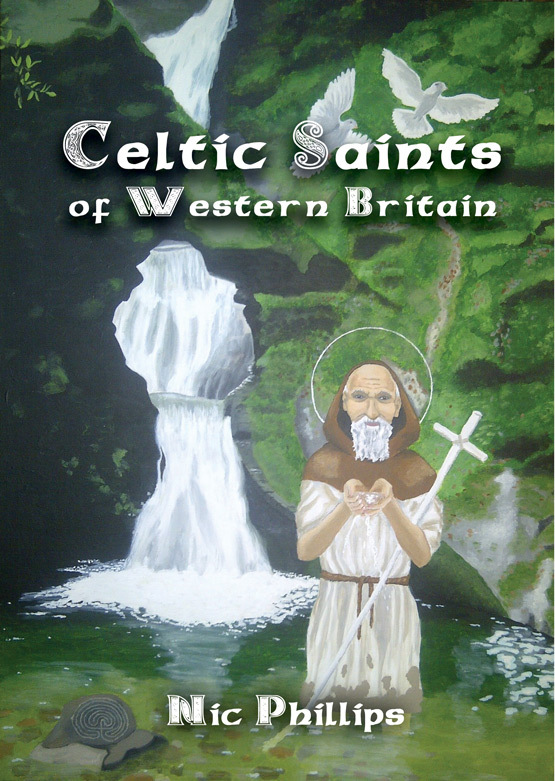 The final illustration for the first chapter of the book, St Keyne, sister of Clether, Morwenna, Nectan and the other numerous children of Brychan. She was described as the fairest of them all, although her looks brought her unwelcome attention so she left Wales and crossed the river Severn where she came across a barren inhospitable land filled with serpents. Gaining permission from the local lord to settle there she turned all the snakes to stone, a medieval explanation for the abundance of the ammonites in the region. This place became known as Keynsham. She later moved on to Cornwall where she settled at the place now called St Keyne and blessed a well with the power that whichever of a newly married couple drank from it first would always have the upper hand in their marriage! Acrylic on canvas (16in x 24in).